Visibility and control over working capital have become key as short-term financing remains scarce. Steve Everett, global head of cash management and head of transaction services products EMEA at RBS, speaks to Philip Kleinfeld about how the bank's liquidity management services can deliver results in challenging times. The way corporates view their liquidity position has changed quite dramatically since the financial crisis. During the go-go years, businesses were increasingly drawn towards cross-border service providers - single centralised banks that can manage capital across borders and currencies. However, as credit agencies such as Fitch Ratings and Moody's binge on a range of commercial and sovereign downgrades, these preferences are changing. "If you go back to the start of the crisis, corporates were looking to consolidate their banking partners and find truly global solutions," says Steve Everett, global head of cash management and transaction services at RBS. "But that's no longer the case. The crisis has regionalised things: clients are moving back to traditional counterparty risk management models because they want to ensure the capital they have will be there going forward." In essence, this means not putting all your eggs in one basket. Corporates want greater diversification in their financial partners and don't want to invest surplus cash in a single entity embedded in less than certain markets - and that puts RBS in a strange position. As a global transaction bank and industry leader, it would benefit from implementing more simplified financial supply chains despite the fact that its clients would not. In the end, achieving a balance between simplification and regional spread has become vogue as CFOs and treasurers look to manage their risks as best they can. "You've got to create a bridge between the true end-to-end, seamless supply chain management and the kind of diversification required to ensure consideration of counterparty risk," Everett says. "At RBS, we're here to support that balance." Since the crisis begun, the need for good liquidity management has become a key subject, and not just as a way of managing counterparty risk. Tight and disciplined cash management can provide the crucial difference between survival and insolvency. Keeping cash buffers in place to mitigate shocks to financial markets and aggregate demand is vital, particularly when the supply of credit remains so congested. According to the latest proprietary research by RBS and Greenwich Associates, 65% of companies want to avoid credit markets in their everyday operations. "There's a lot less raising of funds in external bond markets," Everett says. "It's far easier to use the cash that you have available today and make that work properly than rely on banks. This means corporates are trying to use their own working capital as much as possible to fund their day-to-day activities. The first source of liquidity has become in-house." One way corporates are managing this shift towards self-reliance is through internal banking. Rather than have dispersed subdivisions borrowing and depositing money in local markets, treasurers are looking to maximise the use of working capital through a centralised system. This might seem like a sidestep for transaction banks such as RBS, but there are, according to Everett, still plenty of services that can be offered. "Our award-winning liquidity solutions portal gives our clients the ability to control their own destiny; it is all about getting information out of the banking platforms and onto the treasurer's desktop in real time." "We can supply the product set that enables treasuries to operate as their own in-house banks," he says. "We'll provide all the shadow administration and functionality that they require to do inter-group lending and apply interest rates to their subsidiaries. This puts our clients in charge of their own destiny, so they are in control of their organisations' financial planning." Taste for structured products has also shifted as corporates look to absorb the vicissitudes of the economic downturn. According to the same RBS/Greenwich Associates study, around 60% of European and North American companies have "increased their appetite" for liquidity over the past few years, often at the expense of higher investment return. In Europe, 41% of all businesses interviewed expressed a desire for their assets to be immediately accessible, while a further 47% wanted a limit of no more than nine months. This means that the way money is invested by banks has changed. The kind of product that corporates with excess cash find attractive has shifted from exotic, often baffling asset-backed derivatives to products that CFOs can actually understand - that is, those with a mathematically quantifiable risk status. "Over the past few years, yield has become less important than the preservation of cash," Everett says. "We're definitely seeing a trend towards more short-term solutions as a post-crisis strategy. Yes, they're still using money market funds, but the drive is very much towards the short end of the yield curve, with access to liquidity available as and when they need it. "At RBS, we offer the full range of services and opportunities depending on the company's view of risk; from overnight call accounts through to a behavioural approach to account-based solutions, time deposits, money market funds and longer-term debt securities." Another key trend emerging on the back of the crisis is the need for corporate treasurers to know a lot more about the way their working capital is being managed. For most CFOs, particularly those operating across borders, precisely identifying their working capital needs requires proper visibility and control over their cash balances. The liquidity solutions portal is a tailor-made, secure, online tool designed by RBS with exactly this in mind. "Our portal provides precisely the right infrastructure to do this," says Everett. "Firstly, it gives our clients full visibility around their balances, both with us and with other institutions. Secondly, it gives them the ability to control their own destiny in terms of surplus liquidity and self-funding for their overdrawn positions. We give them access to a range of information so that they can manage and administer their own pooling solution. Our innovative, award-winning portal is all about getting information out of the banking platforms and onto the treasurer's desktop in real time." Although known for its European presence, RBS is a global transaction bank with an in-house presence in 36 countries. Over the past decade, the bank has won several awards for its variety of EMEA cash concentration products. It offers a full range of standard liquidity services - from in-country to notional cross-currency pooling solutions - all of which are designed to fulfil the requirements of control and visibility. It also offers experience and solutions where the effectiveness of those tools is limited. Managing a cash position can be difficult for multinationals operating in certain Asian currencies and other emerging markets where regulation remains tight. "We try to give our clients the full visibility they need to maximise working capital within the particular country they're in, and invest in local products rather than repatriate it into a pooling solution." "With the Singapore, Hong Kong and Australian dollar, you have the freedom of movement to sweep into cash concentration products," Everett says. "But when you get into China and India, you have different regulations and can end up with trapped, unlocked cash. "In these cases, we try to give our clients the full visibility they need to maximise working capital within that country and invest in local products rather than repatriate it into a pooling solution. Time will tell as to how these regulations change. We're already starting to see some of the barriers coming down. With the renminbi, for example, a number of offshore centres have being created where the currency can be traded." The liberalisation of emerging economies may prove to be the most important trend in liquidity management over the next five years. Once the barriers to cash movement fade, the opportunity for greater cross-border centralisation will open. In developed markets, the rise of new regulation, particularly Basel III, is likely to impact on the ability of corporates to gain external funding and reinforce the drive towards self-reliance. As things stand, visibility and control remain the buzzwords of good working capital management. Getting access to liquidity and being able to control how it is used will remain at the heart of RBS's client offering as the impact of the financial crisis lingers on. Visibility and control are the buzzwords of good capital management, according to RBS’s Steve Everett. 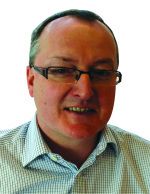 Steve Everett is global head of cash management and head of transaction services products EMEA at RBS.